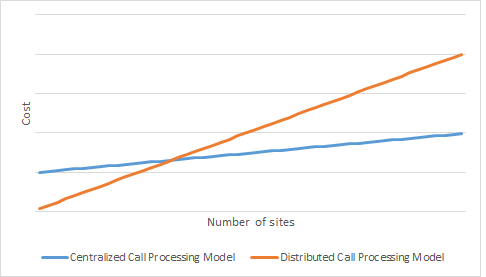 In contrast to centralized call processing, the distributed call processing model maintains call control intelligence at each site. This means that each physical location where there are IP telephony devices is also equipped with a local call processing device, such as an IP PBX, that provides call control to those devices. The diagram below shows an example of such an arrangement in an enterprise network where each branch has its own IP PBX. The branch office IP PBXs are highlighted in yellow. Keep in mind that distributing the call control throughout the network does not negate the advantages of inter-site communication using short codes, because VoIP calls between branches can still be routed via the WAN and are therefore exempt from any telephony toll charges. However, there are some particularities with the distributed call processing model to keep in mind. A distributed call processing telephony architecture, by its very nature, has call processing redundancy built into it. 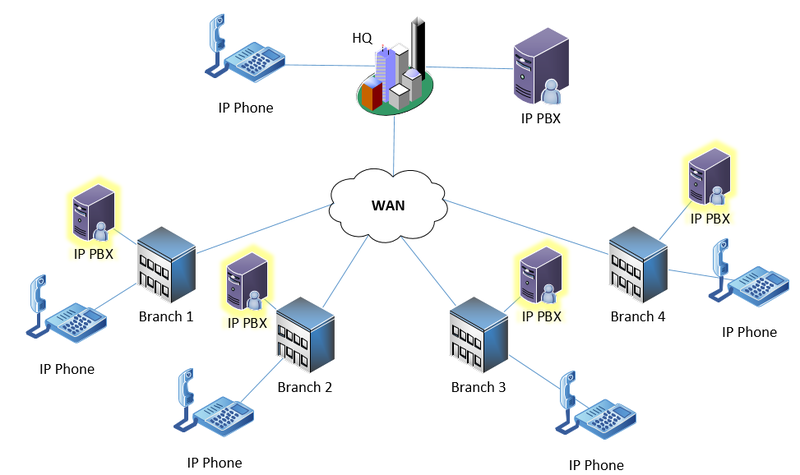 If the WAN link fails at a branch office, the IP phones at that location will not lose their connectivity to the IP PBX because it is on the same premises as the phones. Inter-site communication will be affected of course, but this can be remedied via a PSTN or mobile backup connection and automated alternate routing (AAR). With such an implementation, employees initiating inter-site calls may not even be aware that any network failure has occurred. Keep in mind, however, that the use of AAR via a PSTN backup will incur telephony toll charges. This is usually not a problem, as any such implementation is used as a backup and is therefore temporary. For more information about PSTN backup connections, see our article about centralized call processing. For information about creating PSTN redundancy by connecting to a mobile network, click here. Cost is a major factor in determining which call control architecture a business will choose. Centralized call processing may have larger initial costs due to the fact that the call processing infrastructure located at the central site will have to be able to support the sum of all of the VoIP endpoints at all of the sites. Thus, a much larger capacity is needed, and a more expensive system must be procured. As the number of sites increases, however, a distributed call processing configuration quickly becomes the more expensive choice, because processing infrastructure is duplicated at each site. This is illustrated in the following chart. This more steeply increasing cost of distributed call processing is not only due to the duplication of equipment, but also to the duplication in necessary facilities such as rack space, power redundancy, air conditioning systems, and related datacenter requirements. Distributed call control can also become more complex than centralized call control, because each IP PBX is an autonomous system and must be configured independently. Any interdependencies that exist between the systems at each site must be double-checked for consistency, as well as for the appropriate interoperability. This can be time-consuming when it comes to implementation, maintenance, modifications, or troubleshooting. This implies additional man-hours for network and telephony administration, which, in turn, translates into more expenses for the enterprise. It’s important to note that the choice of a centralized or distributed call processing architecture does not affect the choice of a centralized or distributed PSTN connectivity arrangement. Both types of PSTN connectivity can be applied to both types of call processing models. 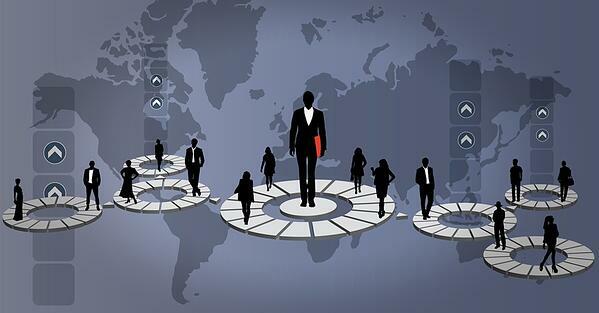 The choice boils down to balancing telephony network availability versus cost. For more details about the different models of PSTN connectivity, including the factors that affect it and the techniques used to maintain the required level of redundancy, refer to our centralized call processing article. Keep in mind that there are other ways to provide redundancy in case the WAN goes down, including connecting your VoIP phone system to a mobile network. Or, check out our article on cost-effective ways to achieve high availability in your VoIP network. The IP PBX and voice gateways for connecting to the PSTN do not necessarily have to be two separate devices. 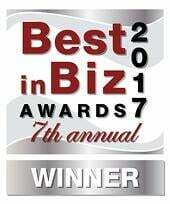 There are many VoIP appliances that incorporate call control and voice gateway capabilities into a single device. These are especially useful and cost effective for smaller-sized branch offices. These dual-role devices can help reduce both network complexity and cost. The distributed call control model can make dial plans more complicated. Make sure to take into account the normalization of the dial plan in multisite deployments. 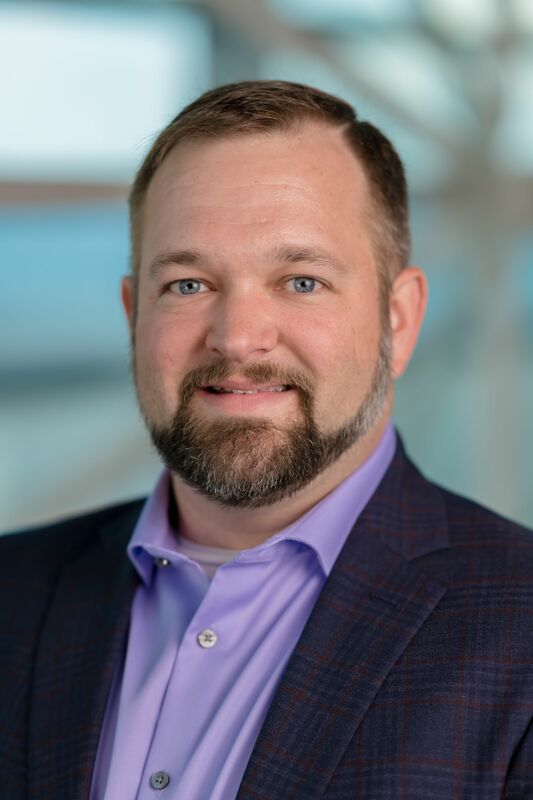 Ultimately, the choice of centralized versus distributed call control comes down to a balance between cost on the one hand, and reliability, redundancy, and availability on the other. Businesses will have to weigh the pros and cons of each scenario against the requirements of the enterprise itself. Then again, there is always the possibility of implementing a hybrid model – more on that in a future article. WAN connections and the SIP trunk: what's the connection?